It’s Saturday morning, it’s warm , the sun is shining and the Spaghetti Sauce is simmering on the stove. I’m sitting and writing “Dallying” waiting for my boots and clothes to dry and my body to recover. Yesterday was another warm and sunny day and I decided to undertake one of those unpleasant but necessary tasks. Our deck is protected from the sun by a Shade Sail. That’s exactly what it sounds like, a large fabric sail-like, shade cover. It looks good and does an effective job. We also get significant shade from the large Black Walnut tree. Here’s the problem. The Walnut produces all manner of black goo from it’s fruit and its leaves over the summer. 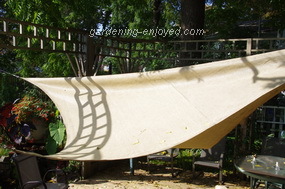 This goo embeds itself in the Shade Sail and before I store it for the winter It needs to be cleaned. That entails a few hours with the pressure washer, frequently aimed over my head. The sail is now clean and drying and will be stored later today. I am wet and rather black from all of that dripping down. I was able to pour at least a cup of water out of each of my boots. I do have the satisfaction of another job well done and done on a warm sunny day. A much more pleasant chore was wandering around the vegetable garden picking up all of the winter squash that I found. Their vines have completely died down and are on their way to the compost. 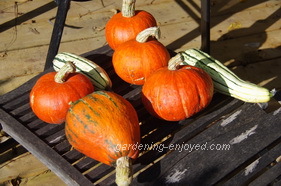 The delightful bright coloured squash have moved to a sunny spot on the deck where they can ripen and mature before they head downstairs to the cold room. I grow mostly Buttercup types because we enjoy their dark, richly flavoured taste. Baked and served with some butter and Maple Syrup it is a wonderful winter taste treat. They will keep in the cold room for a few months; we don’t know how long because we will have them all eaten long before then. I can’t let an autumn copy of “Dallying” go by without again mentioning Bulbs. Spring, mostly, flowering bulbs are another of my garden favourites. Today we are looking at the minor bulbs. They are minor in size only. They are the first things to bloom in the spring and those first bursts of colour are anything but minor to a winter weary gardener. They start with Snowdrops and move on through the several types of Crocus, the bulbous Iris, the upright Puschkinia, then the beautiful swaths of spreading Scilla and Chionodoxa, usually finishing with the Muscari. These tiny delights have other virtues. 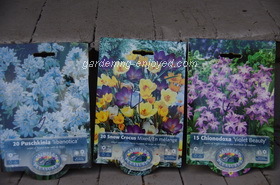 The bulbs are small and easy to plant and many of them are quite inexpensive. Rush out and plant some now. Time to answer a few questions. If you have a gardening question just ‘reply’ to this newsletter and send me your query. I try to answer most of the questions and the ones that I answer here are those that I think will have the widest interest. You can also find the latest garden updates on the front page of gardening-enjoyed.com. I try to change it every few days so check back often. Dan Asks? Can you please answer the following? I need to transplant the following: Dappled Willow grafted tree (3" caliper). Bridal Veil Spirea When would be a good time to transplant. Ken Answers! The short answer is, now. Almost all deciduous trees and shrubs move well in the autumn. As soon as there is any sign of their leaves colouring or fading, start digging. Geryl Asks? We have built an 8 x 10 pond this year and have stocked it with gold fish. It is 2' deep in the middle. I have some winter hardy pond plants in planters around the side and a beautiful lily that I paid a fortune for and don't want to lose. How do you suggest I overwinter the plants and fish? Should I cut back all the foliage, sink them to the 2' bottom, and install a floating bubbler? Do I need to clean the silt in the pond now or can it be done in the spring? Is there a way to overwinter water hyacinth? I have a greenhouse. Ken Answers!At 2' deep your fish might have a difficult time making it through the winter. That, of course depends on how severe the winter is. My shallowest pond approaches 3' and the fish do just fine. If your fancy Lily is a hardy one then just dropping it to the bottom should be good enough. The other plants will probably survive where they are. Water Hyacinths could overwinter in a warm, 50F nights, greenhouse but paying to keep a greenhouse that warm just for $10 worth of Hyacinths could be false economy. My bubblers sink to the bottom in order to oxygenate the water as much as possible. The rising bubbles will still keep a hole in the ice open until a really deep cold. Leave the silt until the spring, the fish will use it to sleep in. Sarah Asks? I have a question. I have a couple potted herbs that have been outside all summer. I want to bring them inside for the winter. Is this possible? How would I go about doing that? Ken Answers! Some Herbs will overwinter inside quite well, Rosemary, Sage but others such as Basil and Chives, just give up after a while no matter where they are. Grow new Basil from seed indoors, it's quite easy to do. Just pick up all your pots and bring them in and see what happens. No fancy prep needed. Lots of light is the critical factor.